This volume is the first step in an aggressive plan to bring the most pertinent ancient books to the public in affordable, collectable editions. The Bible, as we hold it today, is esteemed by many religious institutions and especially Conservative Christians to be the inspired, inerrant Word of God. This doctrinal position affirms that the Bible is unlike all other books or collections of works in that it is free of error due to having been “given by inspiration of God, and is profitable for doctrine, for reproof, for correction, for instruction in righteousness: that the man of God may be perfect, thoroughly furnished unto all good works” (2 Tim. 3:16, 17). 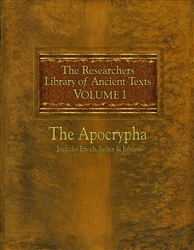 While no other text can claim this same unique authority, Apocryphal and Pseudepigraphal literature such as contained in this volume of The Researchers Library of Ancient Texts(Volume One—The Apocrypha: Includes the Books of Enoch, Jasher, and Jubilees), provides literature that often precedes or follows the chronology of biblical texts, which frequently are used or assigned as supplemental works within academic settings to help students and scholars discover or better understand cultural and historical context within the Word of God. Whether or not the information contained in the apocryphal literature is entirely precise—as is the canon of Scripture—these ancient texts provide commentators’ valuable insight into what many ancient Jews and early Christians believed when, “God, who at sundry times and in divers manners spake in time past unto the fathers by the prophets” (Heb. 1:1). The Researchers Library of Ancient Texts is therefore intended to be a supplemental resource for assisting serious researchers and students in the study of the Bible and Bible times.